Krill often are referred to as “keystone” species because they play such an important role for many marine systems.Krill, a Norwegian whaling term meaning "small fry", Krill are one of the most important elements in the Antarctic food chain. They feed on microscopic plants (phytoplankton) that float around the Southern Ocean. 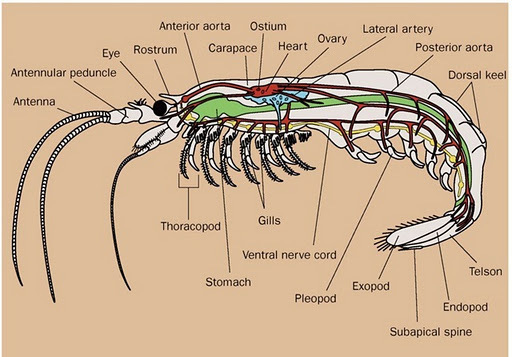 The krill, in turn, then become the basic food for baleen whales, seals, penguins and many seabirds. 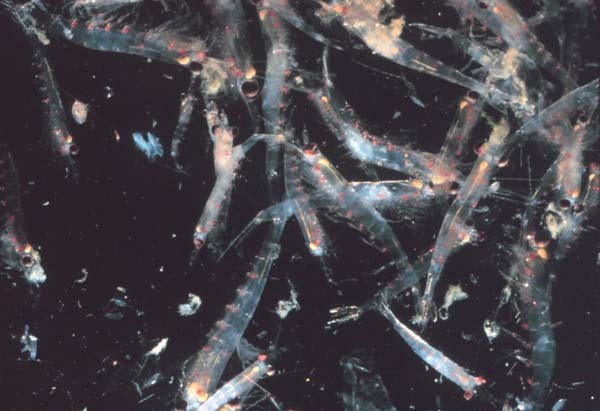 There are two families of krill: the Bentheuphausiidae family, which consists exclusively of a deep-water species called Bentheuphausia amblyops, and the Euphausiidae family, which consists of 89 known krill species, including -- perhaps most commonly -- Euphausia superba, or Antarctic krill. Unlike Bentheuphausiidae krill, the Euphausiidae family is bioluminescent. 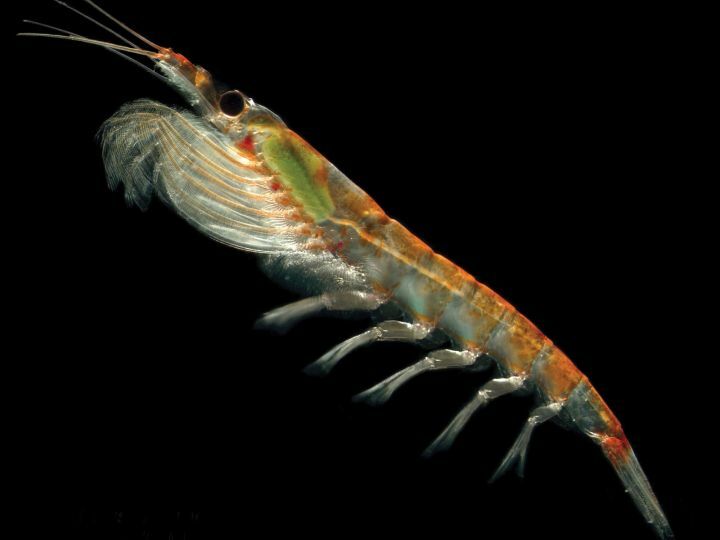 This means that Antarctic krill emit a yellow-green light that is thought to either camouflage the krill's shadow or aid the krill in mating or schooling at night. Krill are invertebrates that grow to about two inches in length and live in large schools, or swarms, as dense as 10,000 krill per cubic meter of water. All krill live in the ocean water column full time. They have legs called “swimmerets” that look like small feathers and function like fins. This gives them great mobility and agility for life in the water column. Krill feed while swimming, using modified legs to form a food basket that separates food from the water while they swim. Most krill hatch from free-floating eggs and pass through larval and juvenile stages before maturing into adults. This development process involves a series of molts (casting off the rigid outside skeleton that restricts growth), during which segments and appendages are gradually added. While the new outside skeleton is still soft, the individual can increase its size. 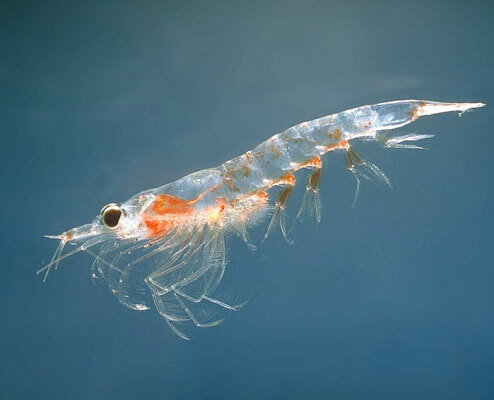 Adult krill have the unique ability to actually shrink in size after a molt if food resources are scarce. Because krill can increase and decrease their size, it can be difficult to determine their age or an age distribution from a population of animals. During the day, krill form part of the so-called “deep scattering layer” that fishermen see on their depth sounders. 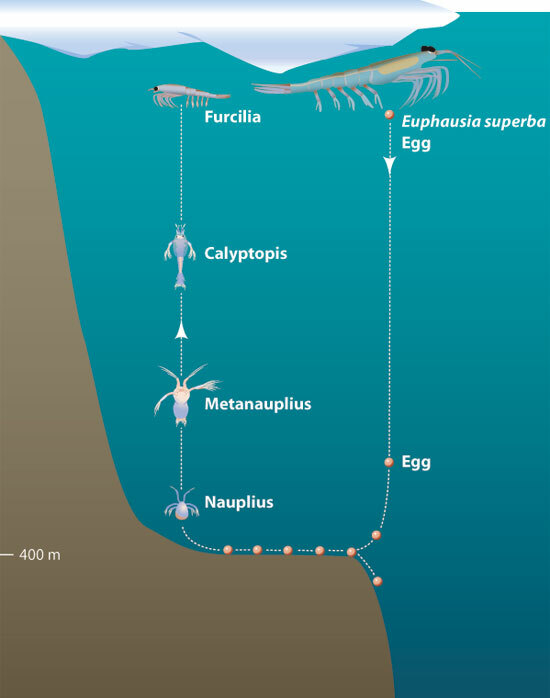 The timing of this daily event in response to changing light intensities provides E. pacifica with advantages relating to predation, feeding, energy and reproduction. By moving up at night to graze on abundant food, E. pacifica minimizes its exposure to certain daytime predators. They also conserve energy by returning during the day to the colder deep water where their metabolism slows and converting food into energy and growth is more efficient. In addition, releasing eggs in the warmer surface layers speeds development times and reduces the time exposed to predators. It also ensures that hatching larvae are in productive waters when they start feeding, thus increasing their chances of survival. Antarctic krill live in the surface waters of the Southern Ocean, which extends north from the Antarctic continent to the polar front -- an area where the cold water of the Antarctic submerges beneath the warmer waters of the Atlantic, Indian, and Pacific Oceans. As this deep, cold water rises to the surface of the Southern Ocean, it brings nutrients from all the world's oceans into the sunlight, making this area home to what is possibly the earth's largest assemblage of phytoplankton. 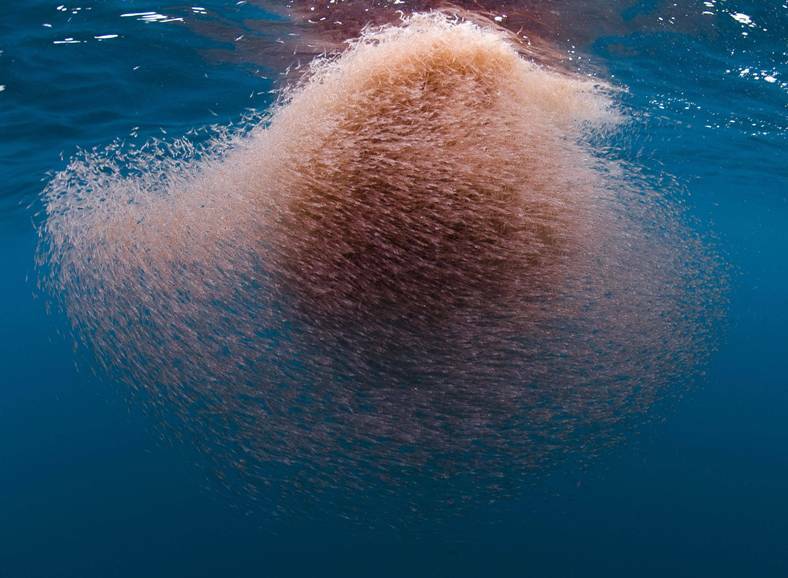 It is this massive gathering of phytoplankton that allows for such tremendous swarms of krill, which harvest the miniscule phytoplankton particles with a specially developed feeding basket that filters them out of the water. The krill also find nourishment by scraping ice algae off the underside of pack ice, particularly in spring. These are successful techniques, apparently, since the total biomass, or weight, of Antarctic krill -- which is estimated to be between 100 and 800 million tons -- may be the largest of any multi-cellular animal on the planet.